This is becoming an annual event! 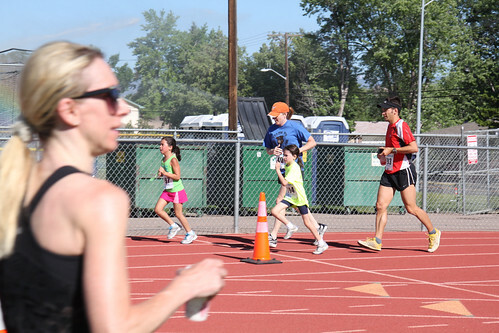 The whole family got up early (for us in the summer) and headed to Longmont High School for the annual race. They have 2 mile and a 10K running at about the same time. 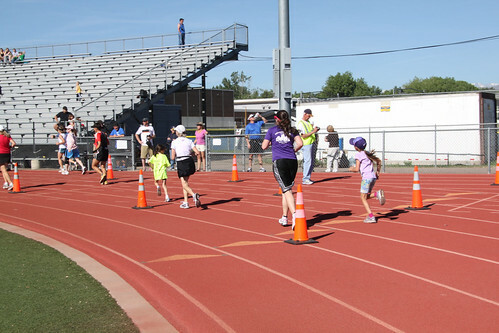 The kids line up for the 2M along with a host of other runners. I wasn’t exactly sure how this would go down this year but I figured I would stay with Reagan and let Sydney run off and do her thing. We got there early and did a lot of warm-ups on the field and general running around as Kayla thought she was really in the race or something. Reagan was more then happy to take Kayla around for a few warm up laps. 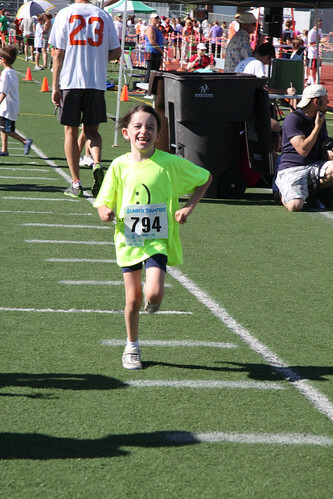 This kid was showing no signs of pre-race jitters. Time to line up for the start! No nerves here. Sydney was wondering what she would do if she was in the lead and not sure where to go. Thinking big I guess. We started off a little better this year at a slower pace. 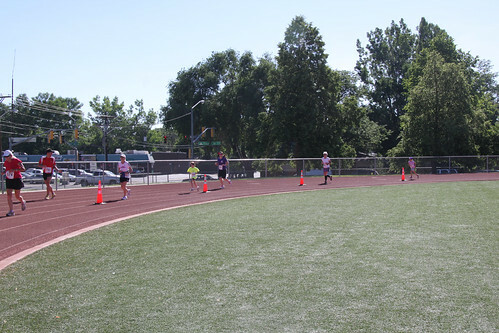 Its hilarious to watch kids burning out and walking 100 yards into the race after sprinting down the street and then realizing they have a lot to go. Reagan immediately ditched her hat as it was hot outside this morning. Sydney was up ahead of us but was already doing some run/walk stuff which I hadn’t expected. Reagan was much more into pacing herself better this year. Maybe it helped that I was next to her and kept it even myself. At about 1 mile, I got tired of pictures so I just turned on my video camera and let it roll. I figured it would be crappy but it was trying to catch her spirit. Sydney was out of sight as we got back to the street to enter the track. I figured she had us beat. I was doing my best to keep Reagan amped up as it was getting quiet and she was starting to hurt a bit. 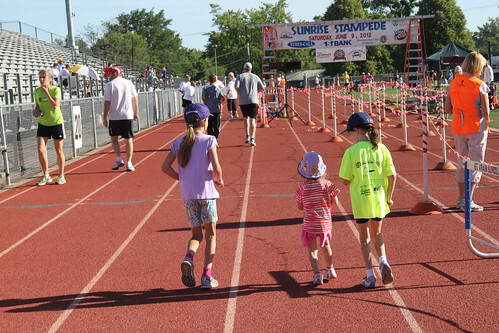 We got on the track and saw Mom there and I think that gave her the boost she needed to get moving around that track. Then we saw Sydney in turn 1 of 4. She had slowed and I think she just went to a walk. Reagan saw the opportunity and took off and flew by her sister making no sounds. I told Sydney to come on and finish strong. But she wasn’t picking it up. We moved around the track. Sydney started trying to make a move but something told me to get Reagan to seal the deal. I started yelling at Reagan to run harder because Sydney was coming. She looked back in fear and then turned on the jets to beat her dearest friend and sister who is 2 years older. 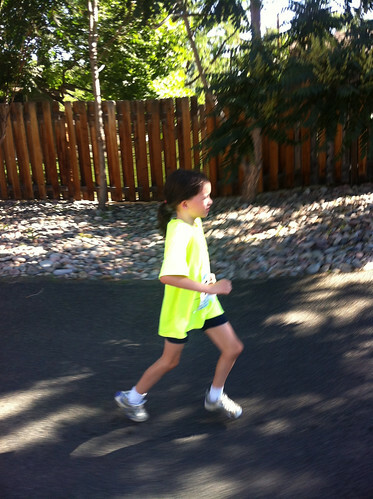 Reagan is fast and she has heart. Sydney looked tired and not sure what just happened. We finished 1) Reagan, 2) Sydney, 3) Dad. Everybody PR’d in the 2 mile too. The race was over but Reagan still had more to go. 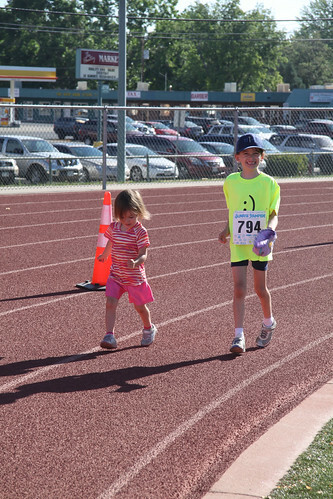 She made a sprint back to Mom super excited about her race. No tears this year. This kid is on fire! 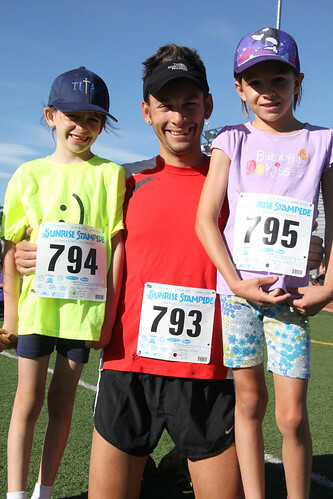 Overall, another great race with the kids. I probably should try and make them practice once or twice before and we could have a real showdown. But its just kind of fun and less pressure to just go out there and run. I probably looked like the over bearing Dad once again telling them to run but hey…they are my kids. If they don’t want to go, I don’t care. But when they do, we get into it! 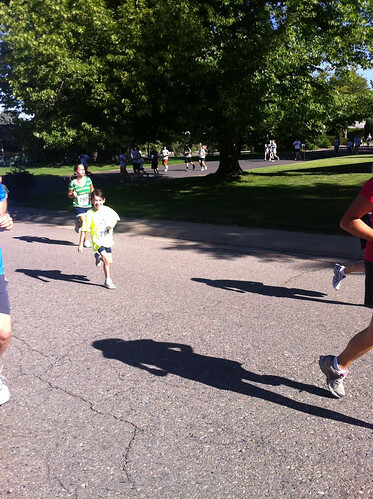 You placed 163rd out of 468 finishers in a time of 21:38 for a pace of 10:49 per mile. Out of 257 women you finished 67th. The winning time for women was 13:42. 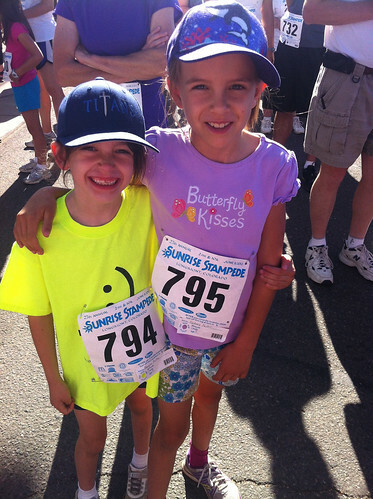 For 7 to 10 year old women you were 8th out of 30 finishers. 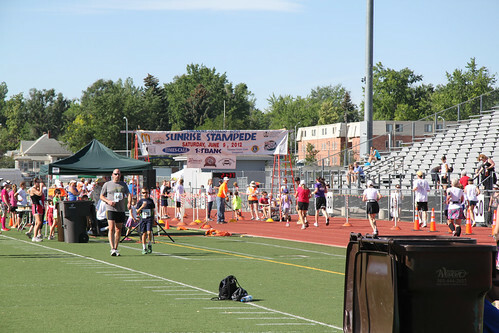 The winning time for this division was 16:51. 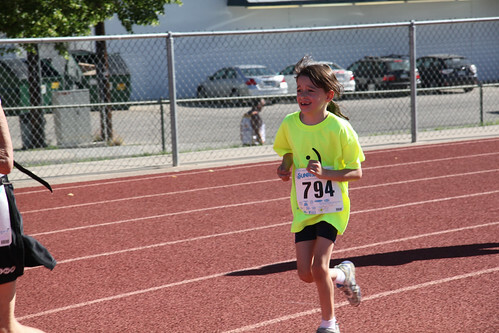 Reagan is 7 and had to run in 7-10 this year…watch out as she gets a little older!